The design is just as infectious as the music it showcases. Launched at 12:01am on January 25th, The Soundsupply curates a bundle of ten digital albums, offered exclusively for ten days, for a mere fifteen dollars. It provides great music, lots of it, on the cheap. It doesn’t get much better or aesthetically rich than this. Brother, co-founders Tim and Eric Mortensen have backgrounds in music, technology, and design—and it shows. Not only is Soundsupply a unique experiment in music promotion, it is a beautiful example of how a designer co-founder elevates a brand’s product. Based on similar business models with bundled software, and deeply discounted experiences aimed at gaining new customers, Soundsupply provides the public with a new way to consume and discover music. Soundsupply’s first package combines the sounds of Coconut Records’ sophomore release Davy (with frontman Jason Schwartzman), Colour Revolt’s The Cradle, and Andrew Dost’s inventive musical about Christopher Columbus, aptly titled Columbus. We couldn’t be happier to support these fantastic bands and this intelligent business model. 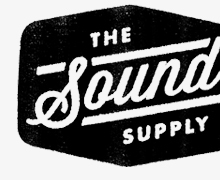 Soundsupply Drop #1 is available for nine more days, be sure to check it out here and get the drop.